Are you looking for a comfortable spring mattress that will give you a good night’s sleep but wont break the bank? If so, IKEA is the right choice for you! Besides memory foam and latex mattresses, IKEA offers several good to high quality spring mattresses in their bedroom furnishings line. While there are plenty of choices you can make out on the market, IKEA might just be the right one because it offers fair quality with the most affordable prices. In this review, we will present and review the IKEA Haugesund spring mattress. The Haugesund mattress consists of a large number of high quality coil springs. The queen size Haugesund mattress has 594 pocket springs that are individually wrapped, which allows the mattress to move and follow your body throughout the night. The number of pocket springs differs, depending on the size of the mattress. In addition to the springs, the mattress also has a comfort layer of 1.7 PCF polurethane foam. A stretch fabric on top of the mattress adds to comfort by moving along with the springs and your body. This IKEA spring mattress comes in regular four sizes; full, twin, king and queen size. The combination of the spring layer, poly foam comfort layer and the stretch fabric equals to 25 cm of thickness, which is more than enough to provide good support during your sleep. 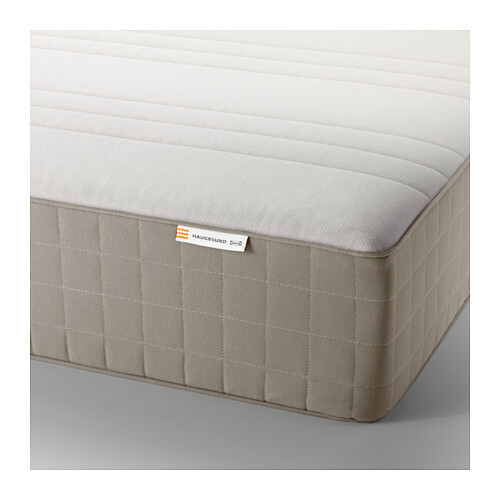 Besides coil springs and poly foam, the Haugesund mattress consists of combinations of polyester and cotton. Most of the wadding is made of viscose fiber and polyester while the lining is done with non woven polypropylene. The stretch fabric on top of the mattress is one of the important materials because it moves along with your body and carries the comfortable feeling wherever you move. IKEA recommends several coordinating products to match with the Haugesund mattress for best performance, which will be discussed below. IKEA offers you to choose whether you prefer a firm or medium firm mattress since the Haugesund spring mattress comes in both versions. While medium firm is significantly softer than the firm one, some customers still state it is too firm for their liking. However, that is a matter of personal preference and thus testing the mattress out before making a purchase is necessary. The mattress, however, comes in dark beige color which makes it stand out above other, averagely gray mattresses. Besides the appearance, the Haugesund spring mattress offers exception comfort with just the right amount of softness to it. However, this mattress is not designed for heavier users due to its inability to endure a long period of time under heavy weight. Therefore, the Haugesung mattress is ideal for kids, teens or any light weight user. Off-gassing will happen throughout the first few weeks after unpacking the mattress, which is usual for these products. Airing it out for a couple of hours every day will help solve this issue quicker. 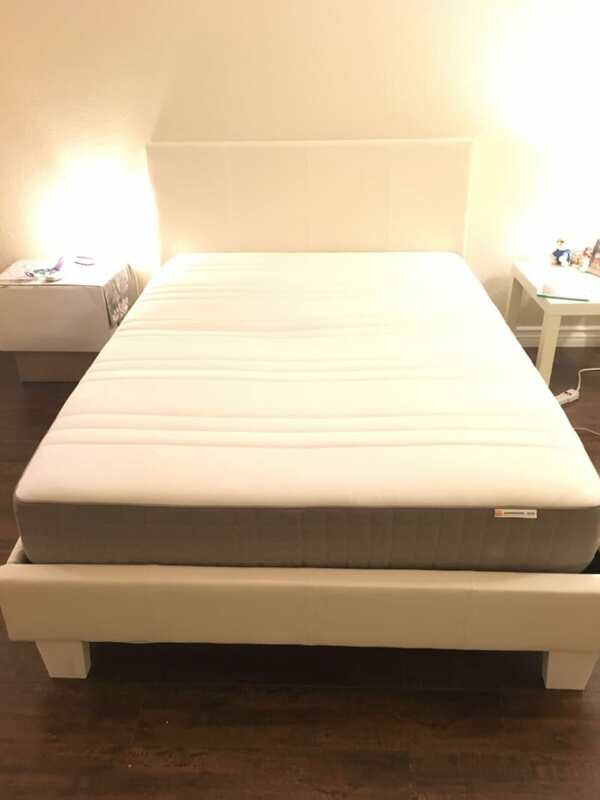 A great feature that comes with this mattress is the fact that the response coils are wrapped individually, which allows them to move separately and insulate movement, making it suitable for couples who sleep on the same bed. The Haugesund spring mattress is designed to be used on one side only and turning it over is not recommended. According to customers’ reviews, the feeling this mattress provides is perfect for stomach sleepers. However, there have been plenty of complaints that the mattress couldn’t hold up heavy weights, which is why you should consider who would use the mattress prior to making a purchase. As mentioned above, IKEA recommends a few products that work perfectly when combined with the Haugesund spring mattress. Purchasing those additional items might raise the budget a bit but it is well worth it, considering the quality that comes with them. The products include the Espevar slatted mattress base, the Luroy slatted bed base, the Tannanger mattress topper and the Tussoy mattress topper. The mattress and bed bases are a good foundation while the mattress toppers add comfort and minimize firmness, depending on your liking. This mattress comes roll packed for convenient shipping. It will, however, take about an hour for it to return to its normal shape after unpacking. 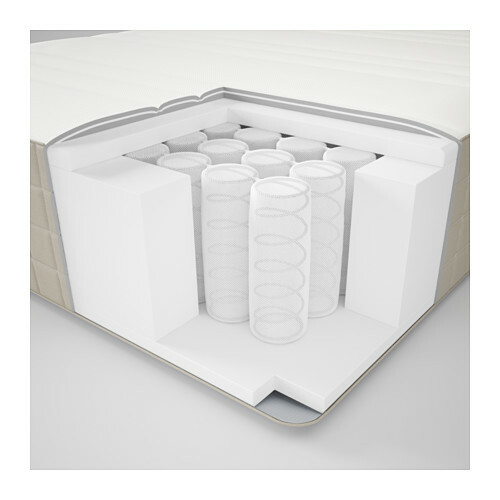 Since the mattress has such a compact packaging, it can easily be transported in a car. Therefore, you can save up a portion of your budget that would otherwise be spent on shipping. You will also save time since you wouldn’t have to wait for IKEA’s shipping service to deliver the product. For the quality it offers, the Haugesund mattress is quite affordable, compared to other spring mattresses on the market. The prices of coordinating products that should go with this mattress also depend on the size you choose. All together, this combination is still an affordable option when compared to what can be seen on the market. The mattress comes with a 25 year limited warranty, which is typical for IKEA’s products. The warranty covers all manufacturing defaults. The company will not take responsibility if the mattress has torn due to being used a longer period of time or due to any customer’s fault. Besides the warranty, IKEA also holds a one year exchange policy, according to which you are allowed to exchange the mattress you purchased for another mattress form IKEA that you find more suitable. Refunds are not allowed and to be able to exchange the mattress, it has to be clean and undamaged. Is IKEA Haugesund Spring Mattress Good? All together, the Haugesund spring mattress is an affordable and comfortable mattress solution for kids and light weight users. It will provide just enough comfort and support to give you a good night’s sleep whenever you need it! The Haugesund spring mattress is an affordable and comfortable mattress solution for kids and light weight users. It will provide just enough comfort and support to give you a good night’s sleep whenever you need it!